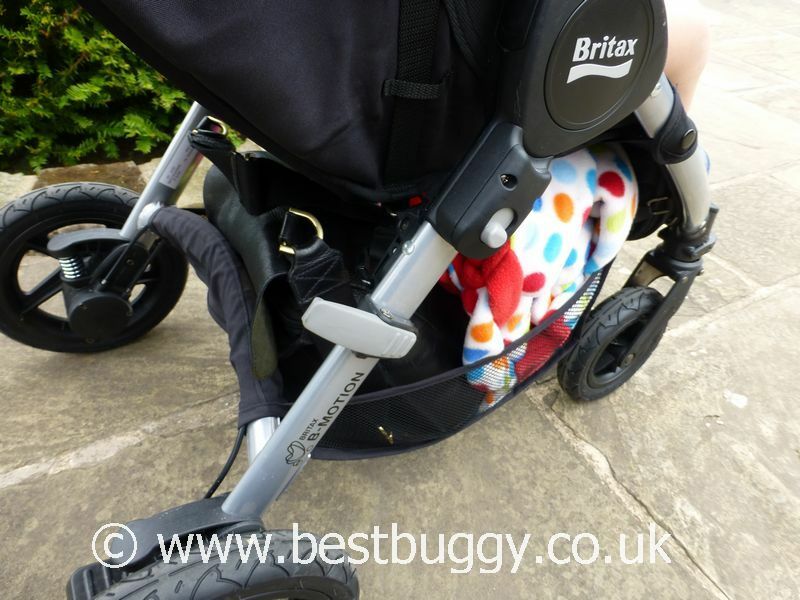 The Britax B-Motion 4 is a very practical single pushchair with all terrain air tyres, bouncy suspension and an adjustable handlebar. It has a roomy seat and lots of storage. Best of all the B-Motion has an amazing one handed, autolocking, quick fold. 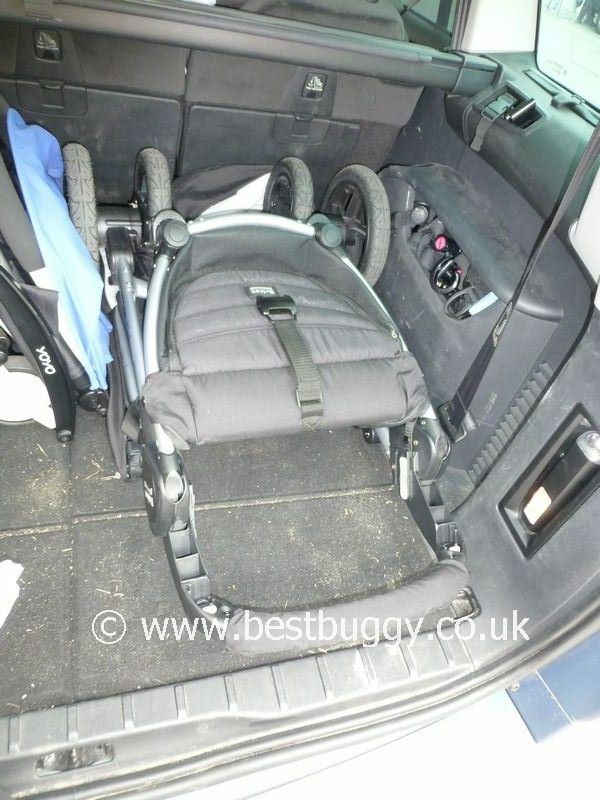 Our first impression of the Britax B-Motion was that the box was fairly heavy for a single, forward facing pushchair. 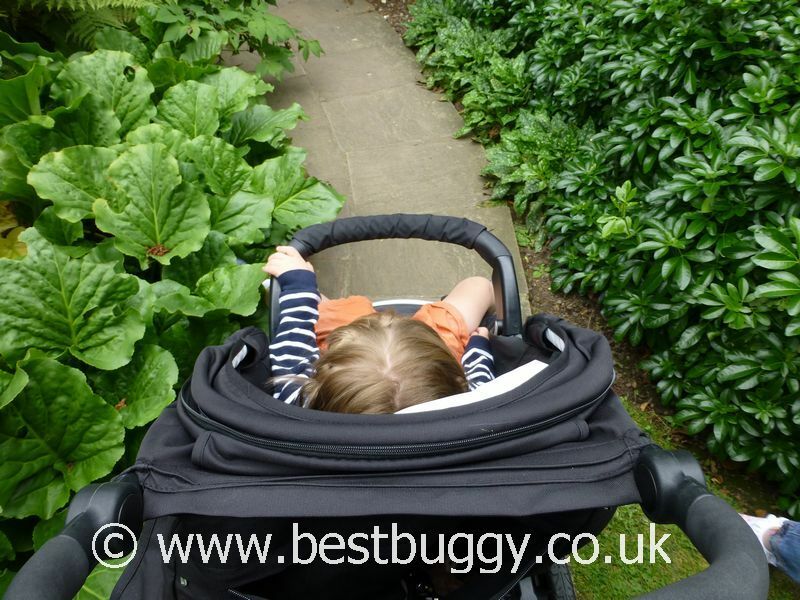 However, all terrain wheels will always add weight to any pushchair, and these are primarily what makes the B-Motion different from the B-Agile. 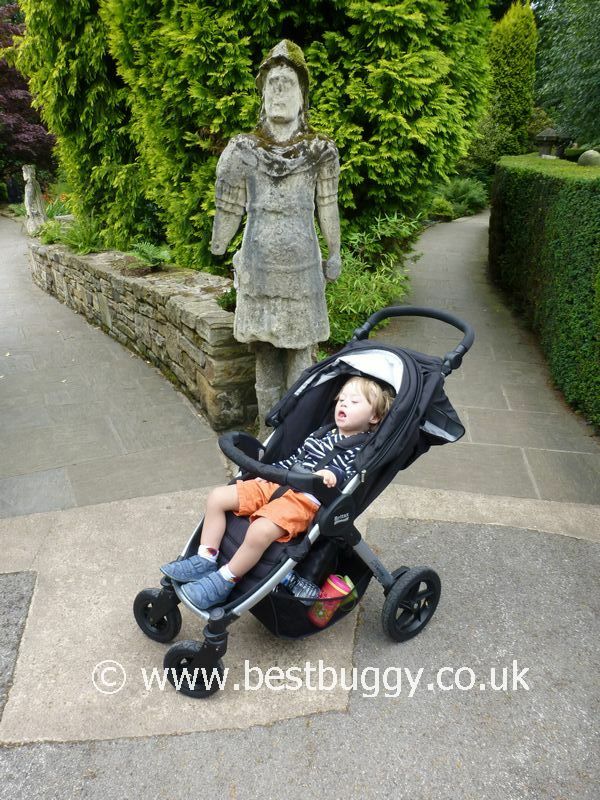 At 10.5kgs the B-Motion is comparable with other pushchairs of its type with small off road wheels but it is not really the lightweight stroller which Britax advertise it as! Upon opening the box, the pushchair itself is a very neat folded size. In the box was the chassis, the 4 small air tyres and the hood. These quickly got put together. 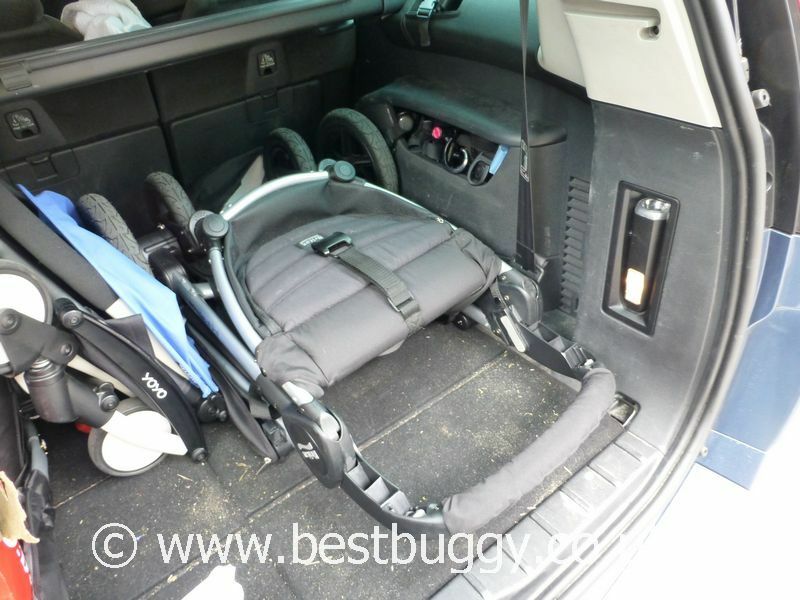 There was also a bumper bar, raincover and Britax Click & Go car seat adaptors. 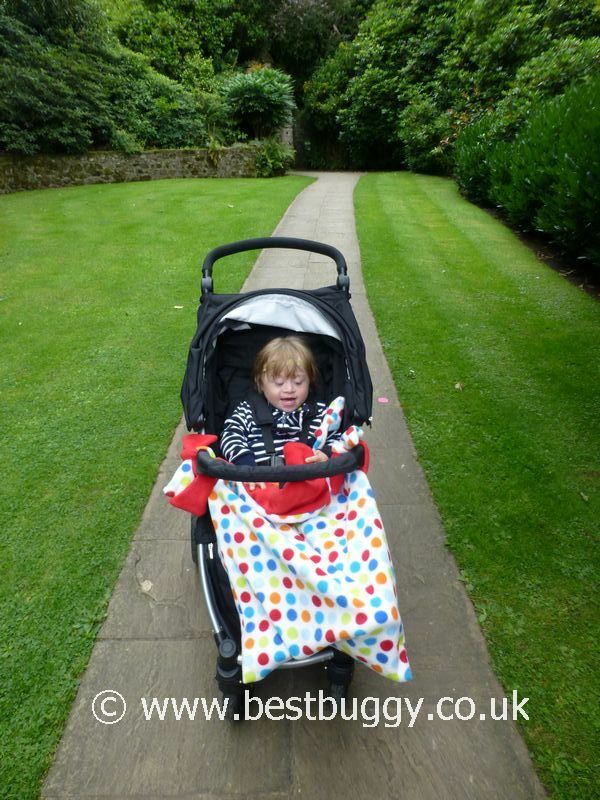 The fabrics feel good quality and the whole pushchair has a sturdy feel to it. 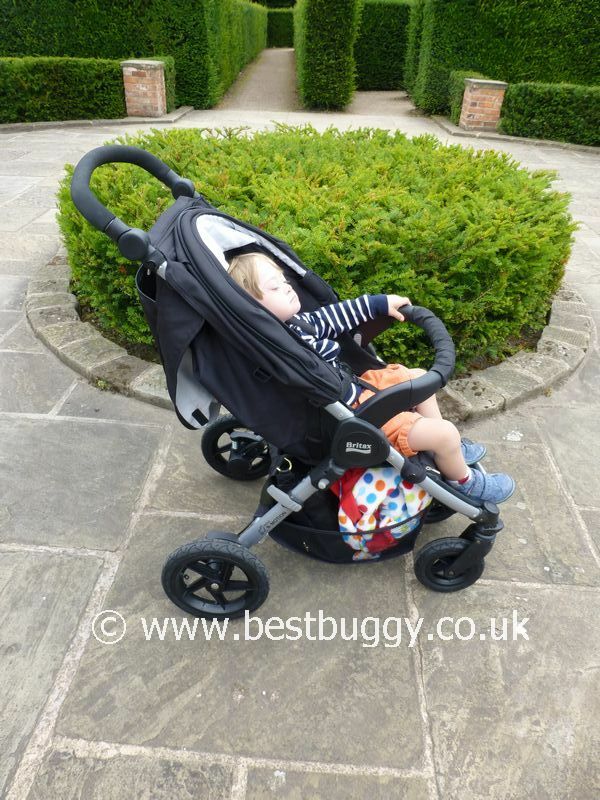 There are huge similarities with the Britax B-Agile but the B-Motion is even better! 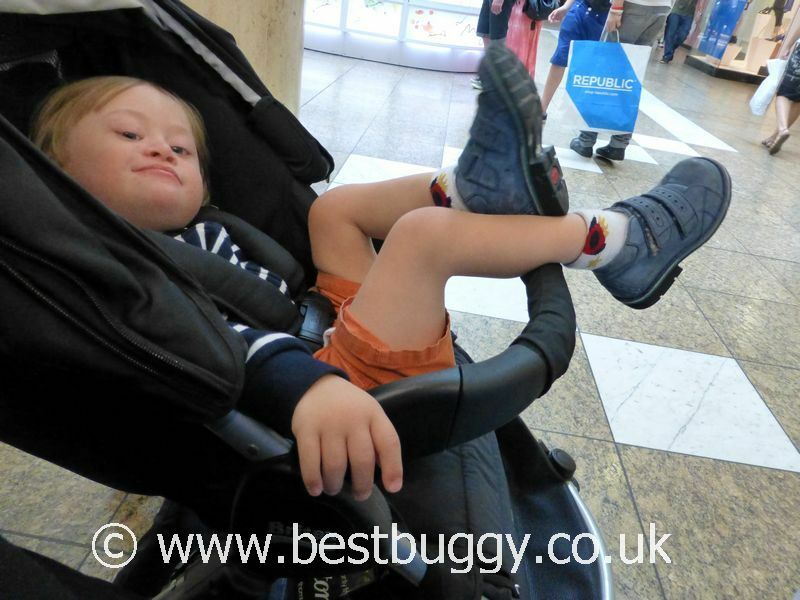 The Britax B-Motion has a generous sized seat with a long knee to footrest length, which makes it an especially good pushchair for an older child. 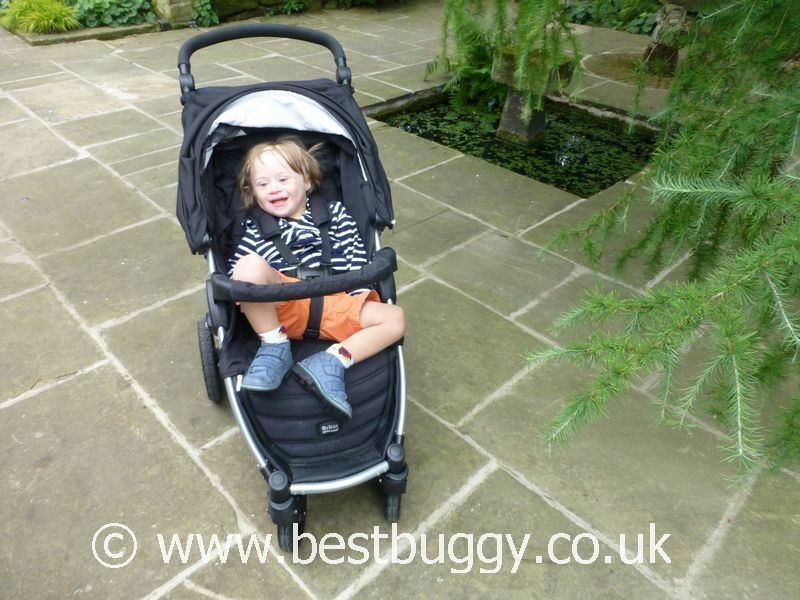 We love that the B-Motion is certified to have a weight limit of up to 17kgs. 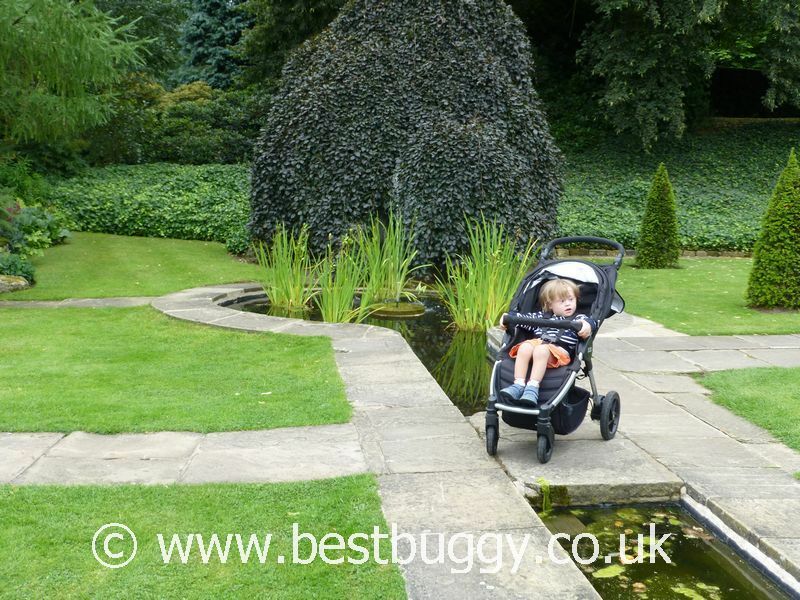 However the B-Motion seat also reclines to flat for a newborn baby, or there is a carrycot or car seat option which makes the B-Motion a very neat, useful travel system. The fabrics feel good quality and fit well. The fabrics apparently remove if desired to make the B-Motion look more pram like in carrycot mode, or for washing. However we did not try this. The deep footrest area is wipe clean which is useful for dirty shoes. The B-Motion seat reclines using a toggle recline, which means the seat can be positioned anywhere from upright to lie flat. The recline toggle needs a delicate touch to prevent the recline dropping too quickly, but the straps are easy to pull. The seat is a generous size for a child to nap comfortably in. Sitting the child up again requires a good push with a shoulder or arm whilst pulling the toggles up together. We like that the toggles can be neatly put together behind a fabric loop. The rear of the seat when reclined, is covered with a mesh panel. This is covered with a solid fabric panel, which can be zipped off if full ventilation is required. 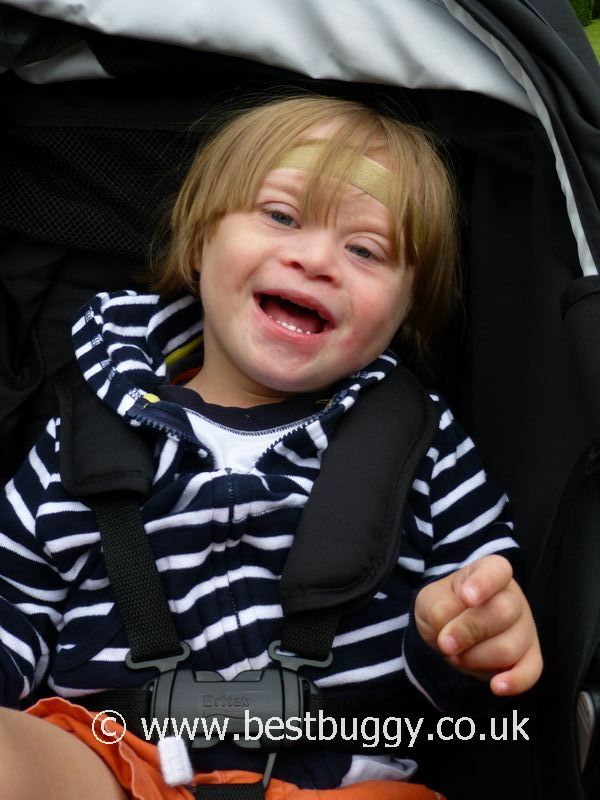 The Britax B-Motion harness is a good quality one. The buckle is simple but robust. We love that although the harness can break into 5 points, it is not easy i.e. they dont simply drop off. This is great because its hard enough trying to do up a wriggling toddler with 3 points to close, never mind 5. The shoulder straps can be pushed off by squeezing the buckle slightly e.g. to put on a footmuff or liner. There are 3 height settings for the shoulder straps. 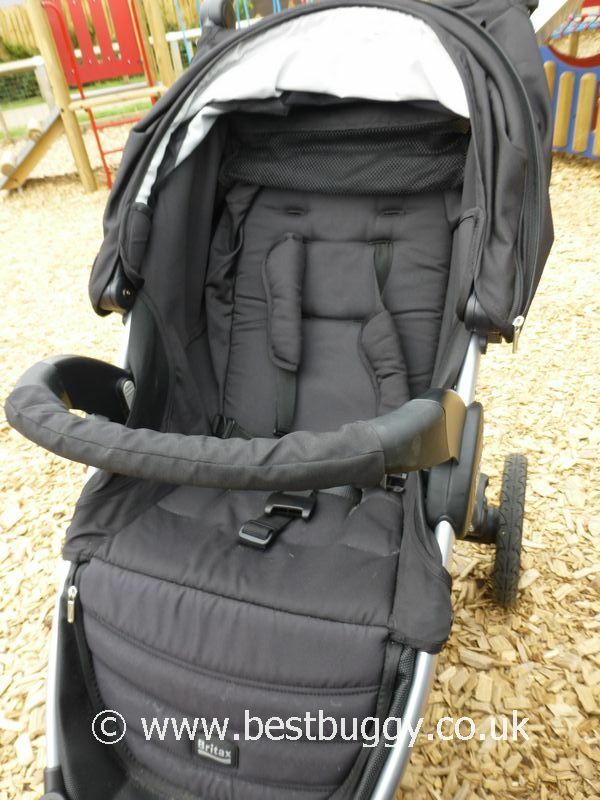 These are easy to alter by simply pushing the harness through to the back which is good if you have different aged children using one pushchair. Our 3 year old had the harness almost on the tightest harness settings, so we are concerned that the harness may not go tight enough for a young baby. 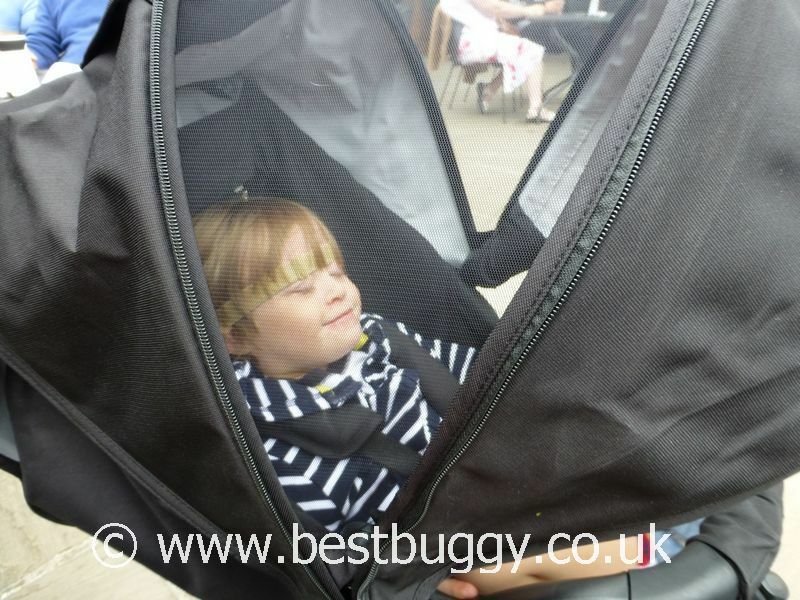 We would suggest that maybe a liner or baby snug / cocoon may be useful for a younger child. There are shaped padded shoulder pads, however there is no crotch pad. 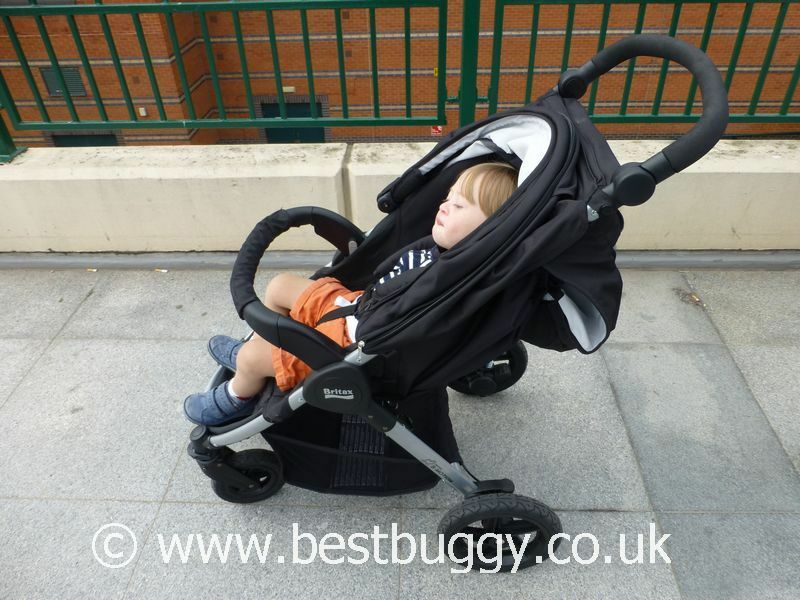 Our one big criticism of the B-Motion is that our 3 year old slumps and slides forwards in the seat. At first we wondered if this was personal to him, however we have heard this mentioned elsewhere. We suspect that if we sewed the crotch strap a inch or two further back, that he would be held in a better position, and would be unable to slide forwards. One member of our team thinks that having the seat slightly more upright would also help, as her children find the seat too reclined. 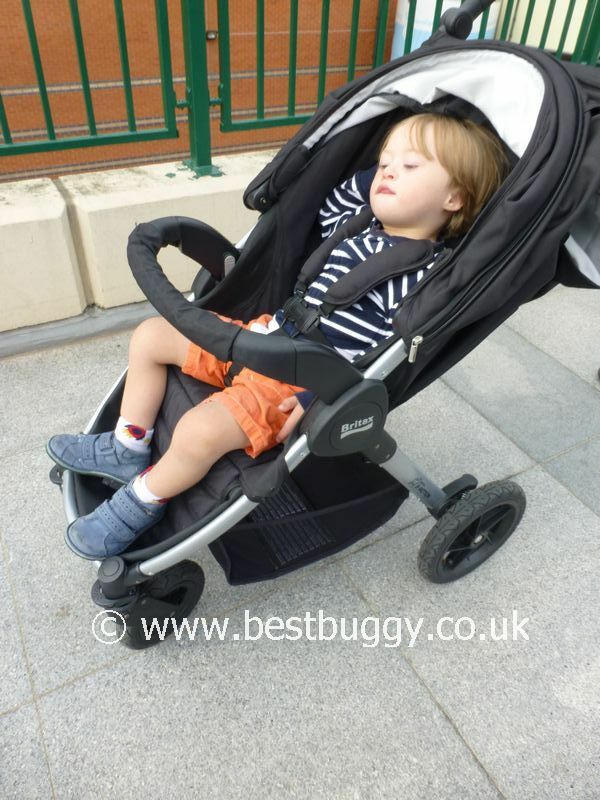 We have found the same issues with other Britax pushchairs (apart from the Affinity). We would urge Britax to look at why children slump in their seats, because this issue is letting great products down. 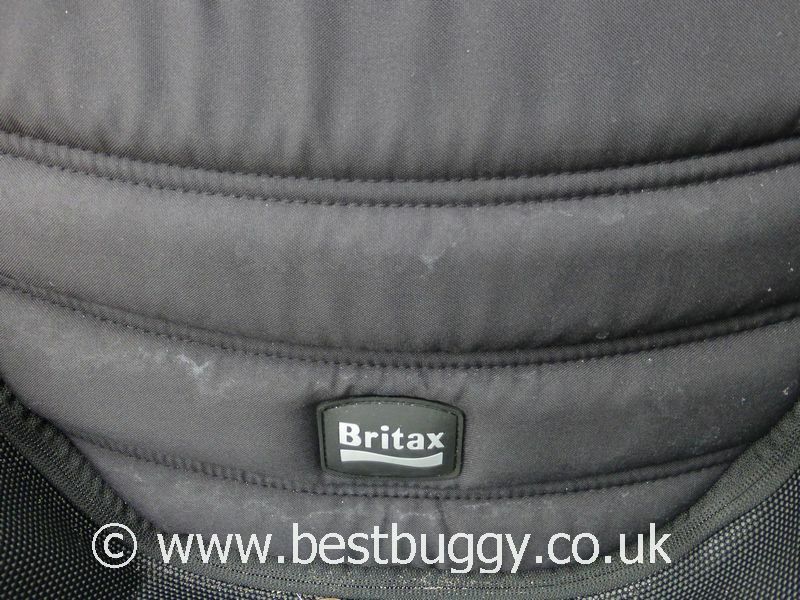 The Britax B-Motion has a hood similar to many of the other pushchairs in the Britax range. There is a 2 fold solid hood, with a zip out centre mesh panel. The main solid hood is great, although a 2 fold hood does not provide large coverage. Opening the hidden centre mesh panel does make for a much bigger hood. However we are not huge fans of the mesh panel for several reasons. First of all it doesn’t provide the darkness for a napping child. In sunshine the mesh allows the sun to be directly in the eyes of a child – especially a reclined child. In both winter, and summer the 2 folds is really not sufficient for good shade or good shelter from winter weather. We have noted that the mesh panel on the Britax Affinity is the rear panel of the 3 hood panels, and this works much better. The handlebar on the B-Motion is SO comfortable. I love taking hold of the soft foam of the handlebar. The B-Motion handlebar, unlike the B-Agile handlebar, is adjustable! 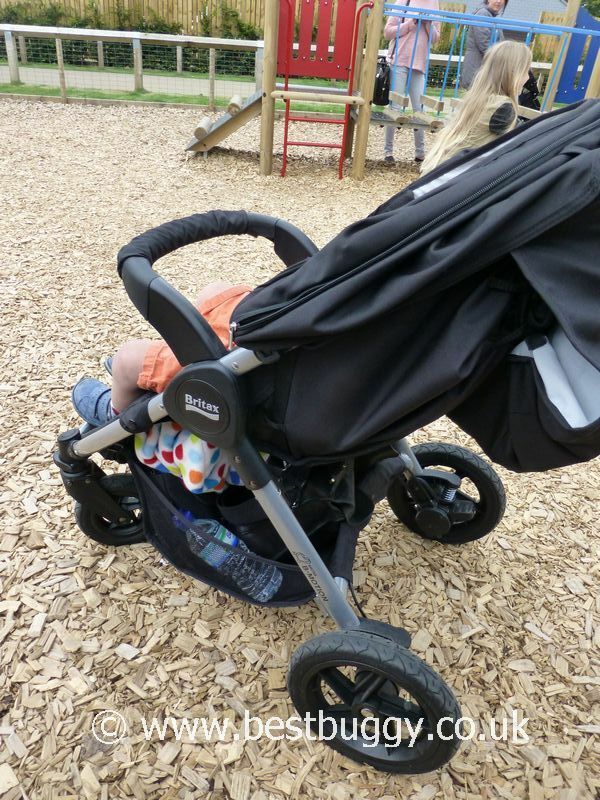 The pivoting handlebar has 8 height positions to suit any parent from short to tall. This is a MASSIVE improvement, as one of the major issues listening to feedback on the B-Agile has been the low height of the handlebar. 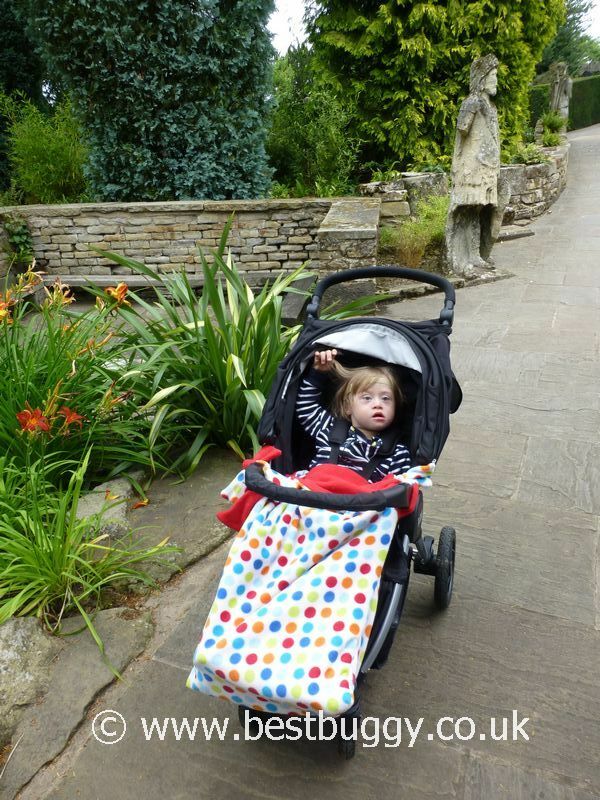 A handlebar can make a big difference to the experience of pushing a stroller and this is a lovely handlebar to hold. The downside to this foam handlebar is that when wet, it can be slippery. It could potentially damage more easily than a dense foam handle too. The Britax B-Motion is all about the wheels! However the suspension is pretty good as well! 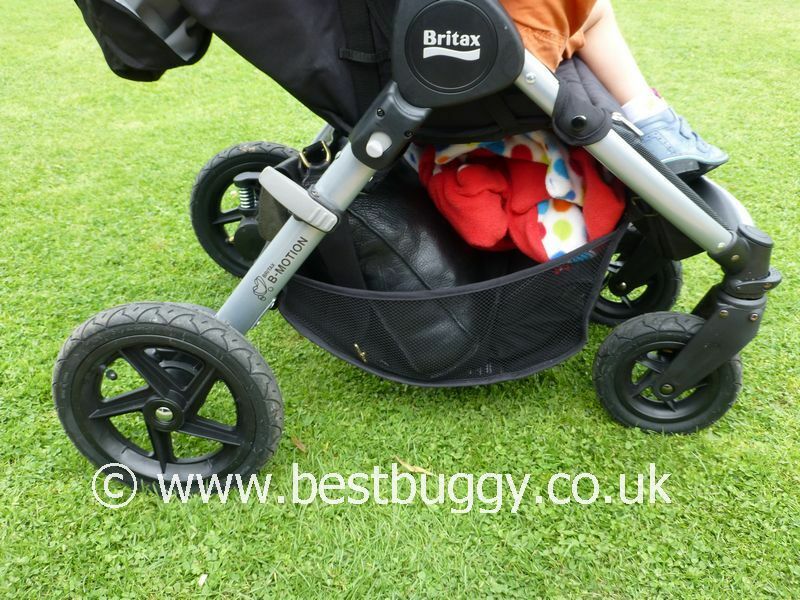 The Britax B-Motion has quick release rubber air tyres. The 2 rear 10″ wheels and the 2 front 7″ lockable swivel wheels give a great push across all sorts of terrain. We have been on flat surfaces, bumpy surfaces, across bark chips, mud, grass and even sand. 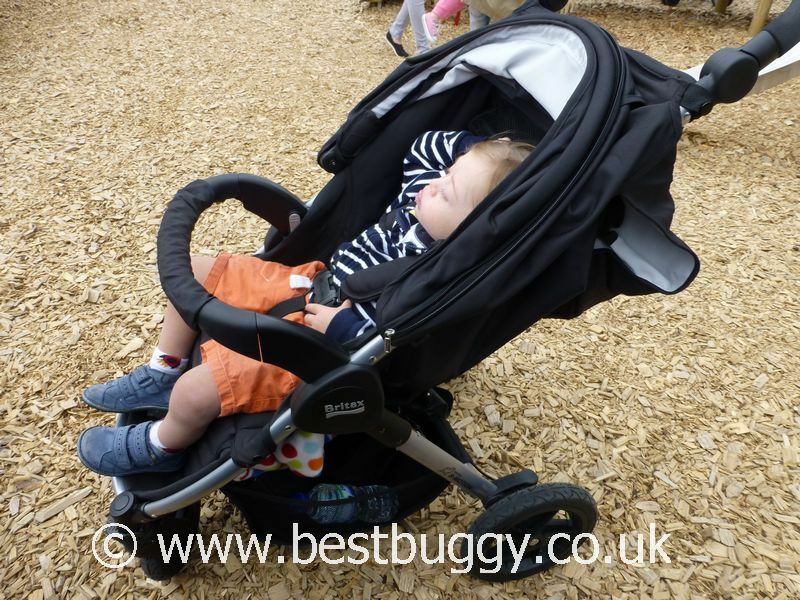 The B-Motion however is not an all terrain pushchair – it struggled with the soft sand on the beach – it was great on the harder sand and on larger pebbles. Locking the front wheels makes it easier to push across rough or soft ground especially the bark chips. The high rear axle is high which should make the B-Motion good in snow, however it is the wrong time of year to try this theory out! For what the average parent does, the B-Motion would cope well in every day life. The rear suspension is very visible at the back and can be felt working hard as you push the B-Motion along. However there is also front suspension as well! 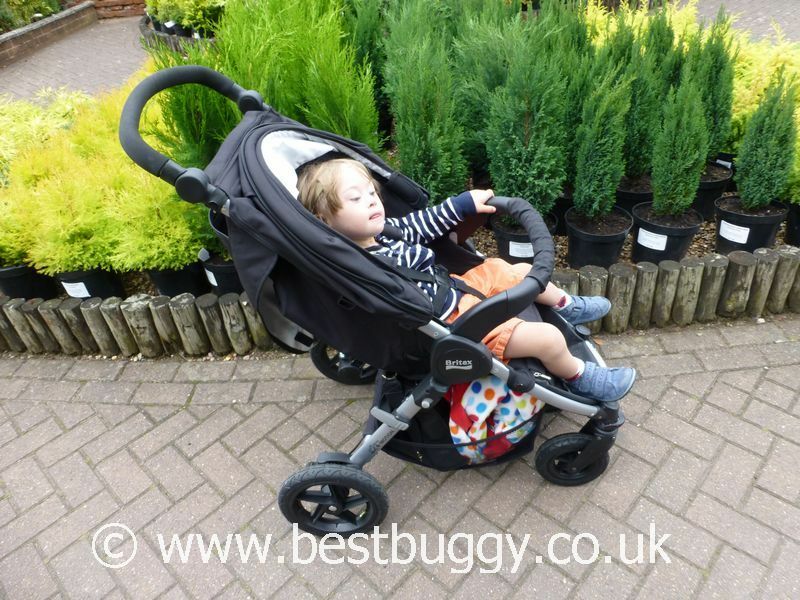 We love the bouncy feel to this pushchair. The push and ride are good although the B-Motion is quite heavy to steer, and not particularly responsive. However this is the trade off for having the off road wheels. The B-Motion has a small footbrake near the right hand side back wheel. It is decisive when applied. The Britax B-Motion has a good amount of storage. The basket is generous, although access is restricted. As the photos show, I just managed to squeeze my handbag in past the raised curved bar at the rear of the basket, (we couldn’t get it through the sides,) but it took a big tug to pull it out and the end of each outing. However the elasticated sides of the basket mean that smaller items could be easily pushed in and out at the sides. 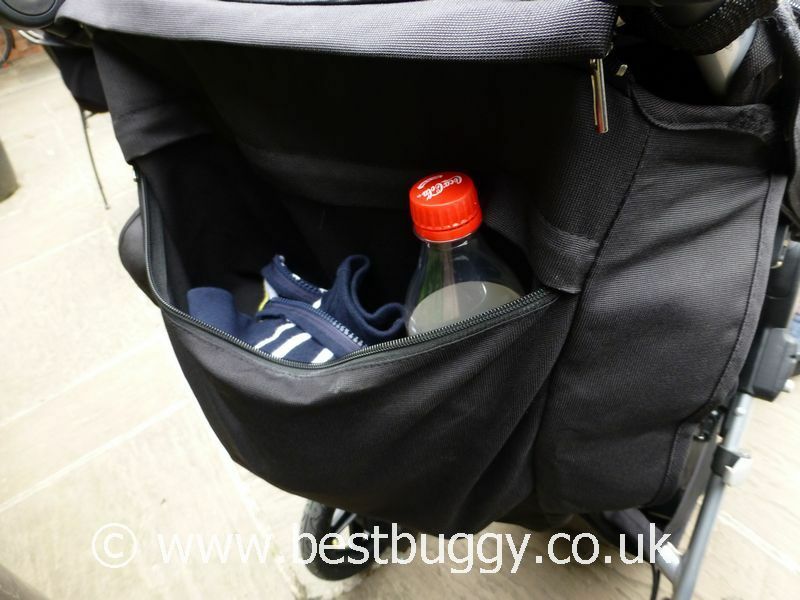 We do not think the average changing bag would fit underneath.There is also limited access via the zipped front panel of the footrest (the zip is there for easy removal of the fabrics in carrycot mode and for washing) to the basket. One of our biggest plus points for the B-Motion is the large pocket in the rear of the hood fabric. This zipped pocket is incredibly useful for dropping in keys, phone, camera, coats etc. and for having them easily accessible whilst not on view. The Britax B-Motion comes with a padded covered, bumper bar which is a useful accessory to have. It is gate opening, however the release button is not intuiative and we found ourselves having a fumble for the button, before simply lifting our son over the bumper bar! Our son seemed to make most use of the bar as a footrest!! The wonderful people at Britax also enclose Click & Go car seat /carrycot adaptors in the box, which is very thoughtful of them. 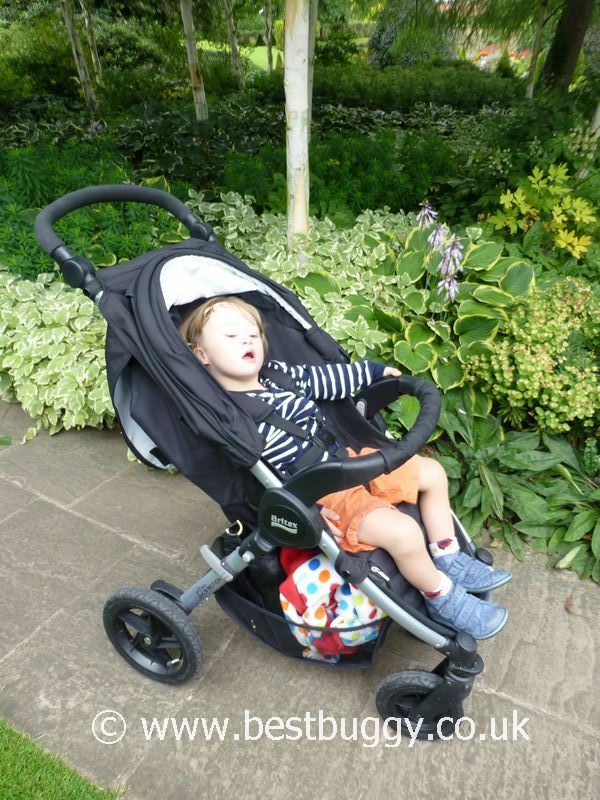 The adaptors mean that the Baby-Safe infant carriers, Baby-Safe Sleeper or carrycot all click straight onto the pushchair. However, the B-Motion seat does lie flat making it suitable for babies from birth. 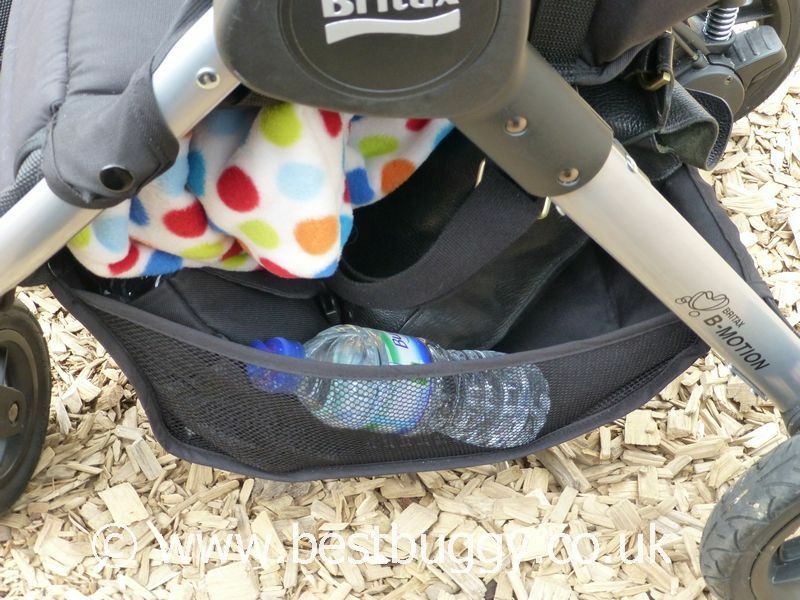 Britax also do an optional snack tray for the B-Motion which is a fab accessory for days out. 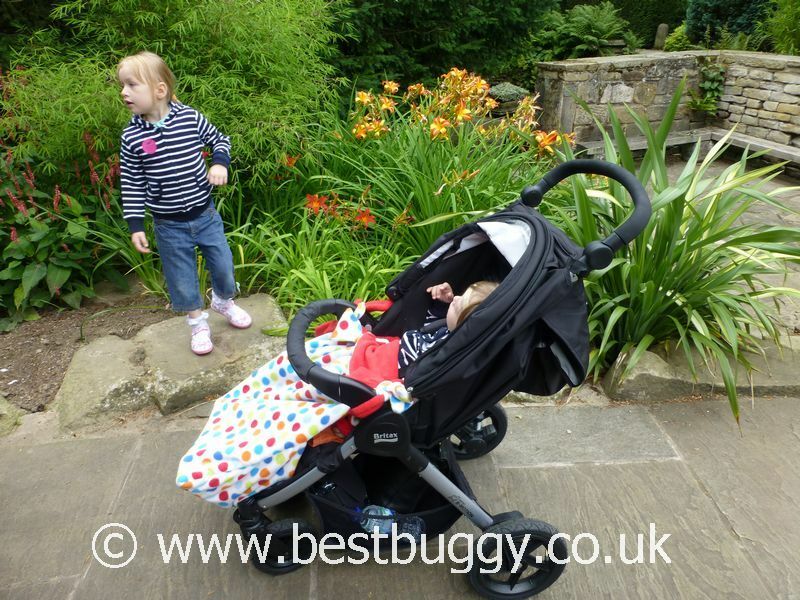 The B-Motion fold and unfold are huge selling points of this pushchair. 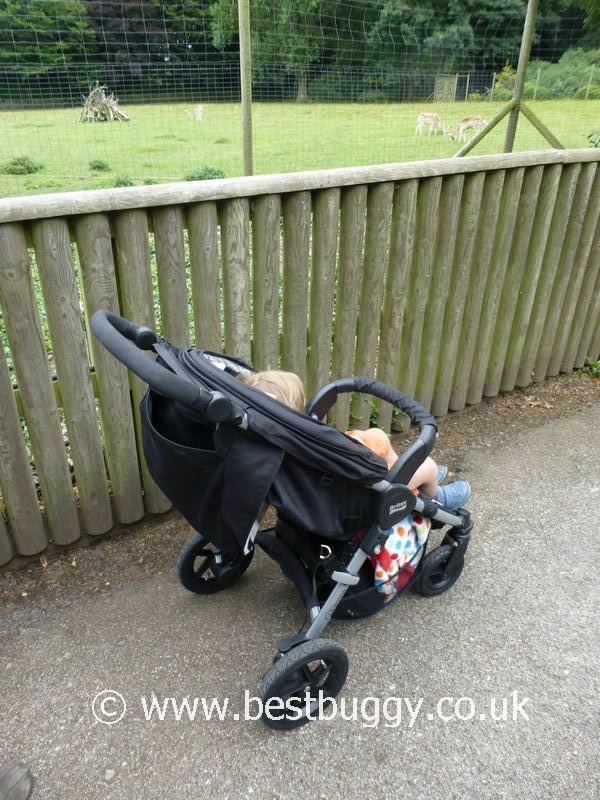 Opening the pushchair involves undoing the locking catch and then pulling the pushchair open. Opening the B-Motion is slow and steady, which is actually good because then there is control over the opening. 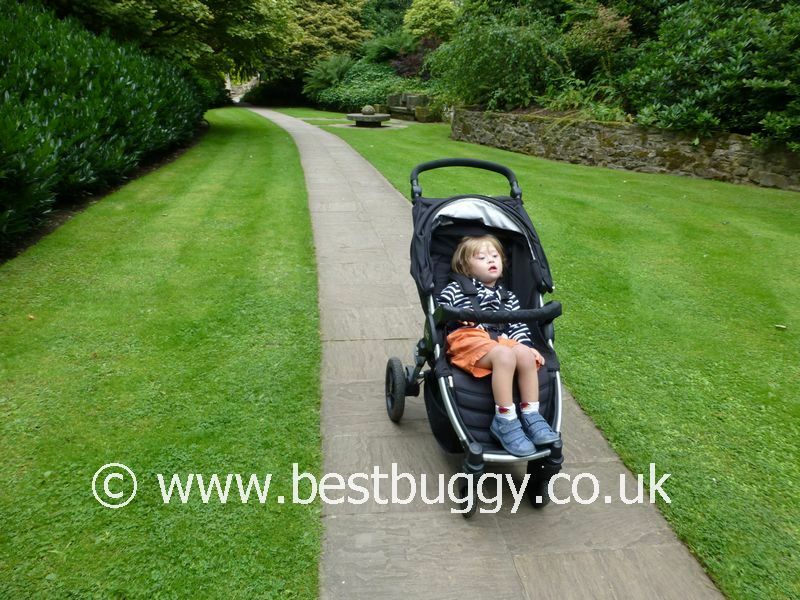 Having control means that the pushchair can slowly be rotated upright onto its wheels before the final click open. I find this easier than the B-Agile. 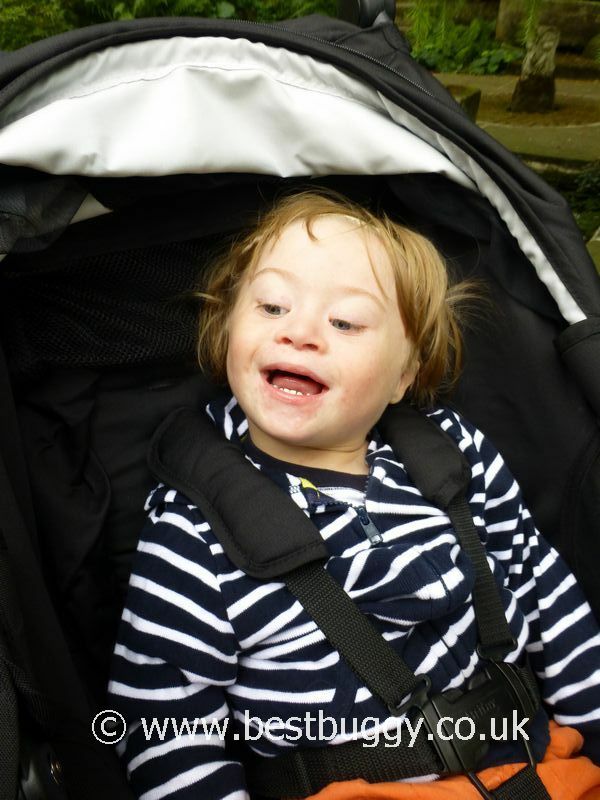 Folding the pushchair is a little easier. On the side of the B-Motion is a grey button. This needs pressing upwards and in. This button then holds in position. so that the same hand can be used to grasp hold of the handle in the centre of the seat, before pulling upwards to complete the fold. The folding motion is quick and autolocks at the end. Thus the B-Motion can be a one handed fold. 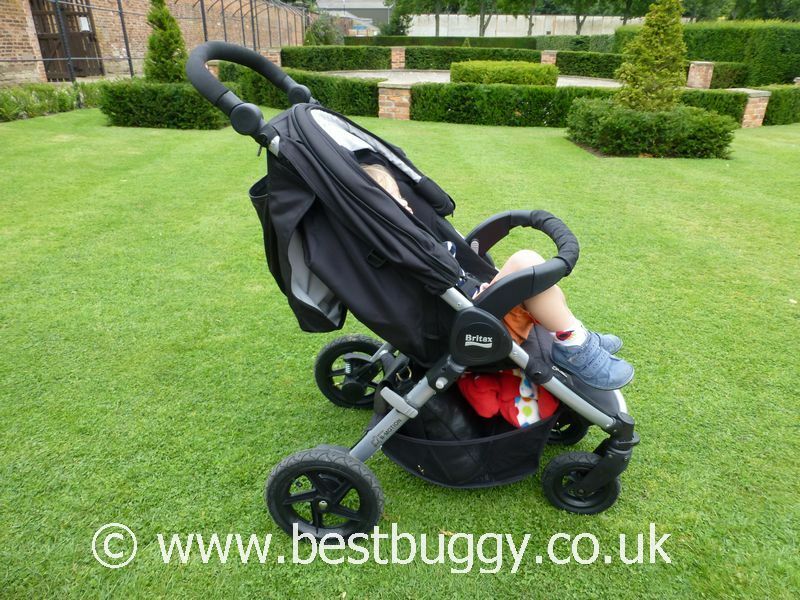 Equally the B-Motion fold is not quite as ‘snappy’ when closing as the B-Agile which is good – we think this is because of the additional weight. 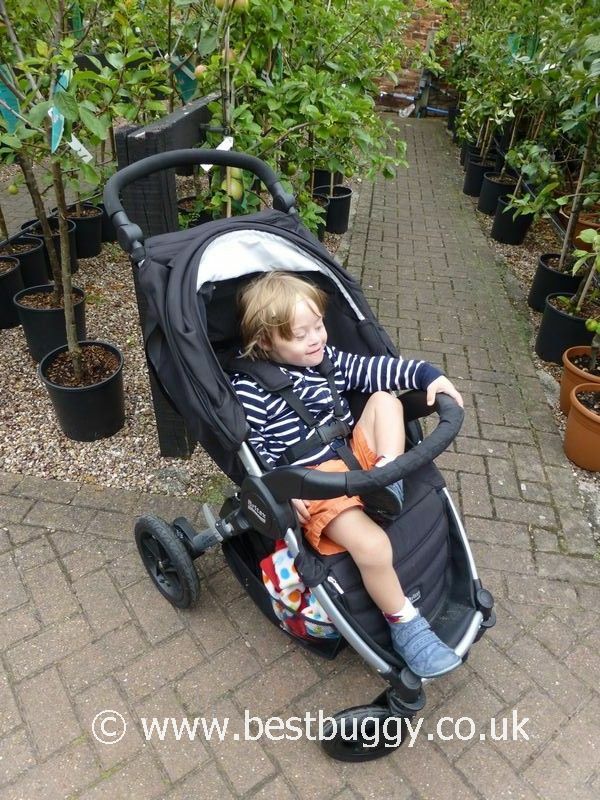 We love that the B-Motion can freestand when folded, by folding the handlebar back 90 degrees away from the pushchair. The neat flat fold of the B-Motion is really excellent. However, in our photos the fold does look larger than it should be because of the bumper bar. Leaving the bumper bar attached elongates the fold by a fair proportion of the whole fold. The downside to the fold is that the fabric is on the outside. We were pleased to have had a B-Motion in Neon Black because our B-Agile was in Chilli, and it attracted dust and fluff like a magnet. The Neon Black fabric has been no problem. We have however had one issue. We got caught in rain at the beach, and although we had a raincover on most of the time, the rain has left white tide marks on the footrest area of the B-Motion. 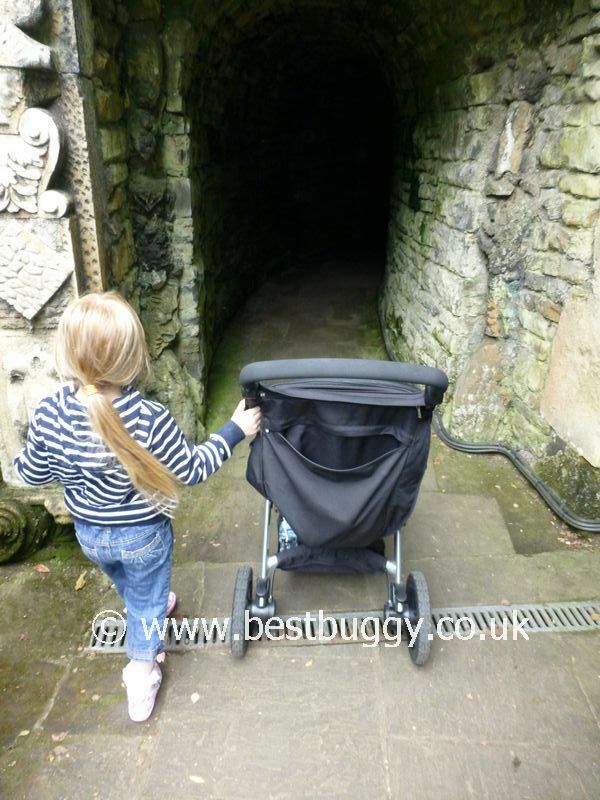 The Britax B-Motion 4 is a great all round pushchair with small off road wheels, which really copes well with most situations other than the extreme. The quality is good, the fabrics feel hard wearing and the B-Motion is packed with easy to use features. 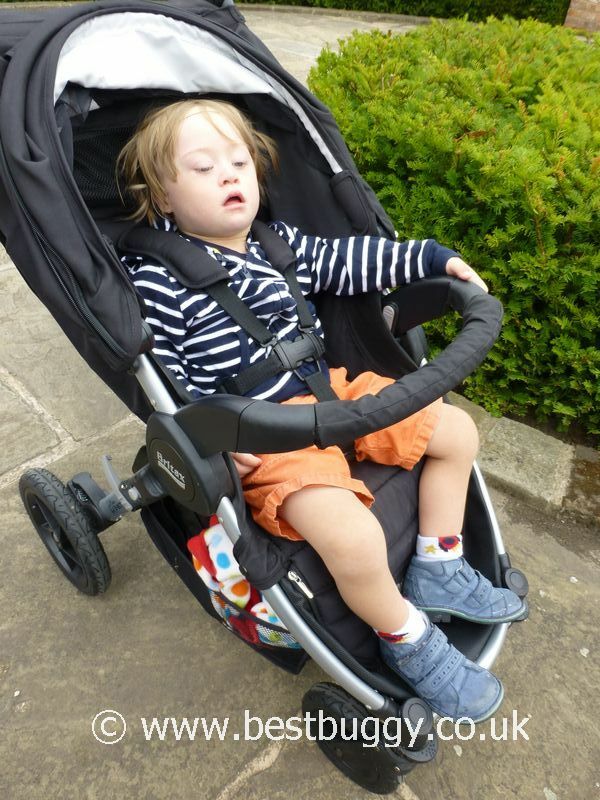 The toggle recline to flat means that the B-Motion is suitable for use from birth, or can accommodate a sleeping toddler well in the roomy seat. 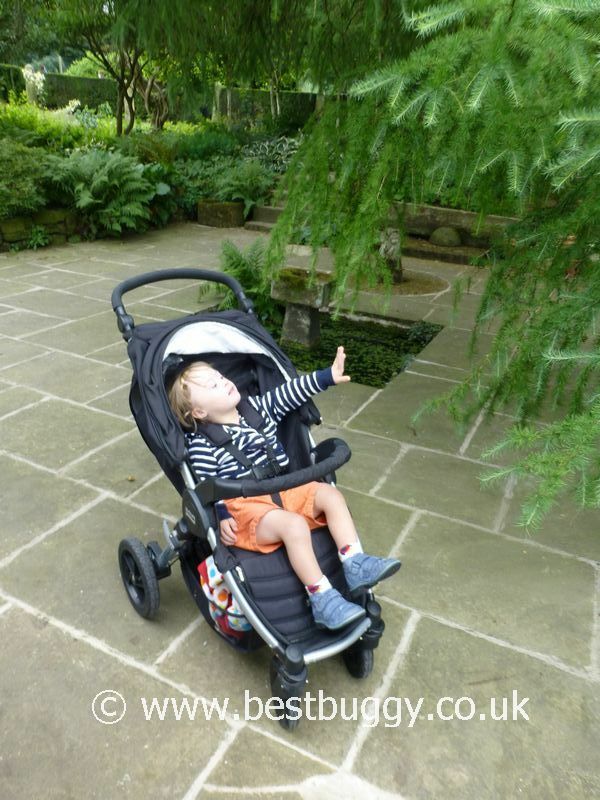 We feel that the harness ideally needs some adjustment to stop a child from slumping down in the seat, but we believe this could easily be resolved. There is plenty of storage although the basket access is restricted. The quick and freestanding fold are excellent and the B-Motion can easily slide into a gap in a car or house. The inclusion of the bumper bar, Click & Go adaptors and raincover, all at a very competitive price does give the B-Motion a huge advantage over its competitors. 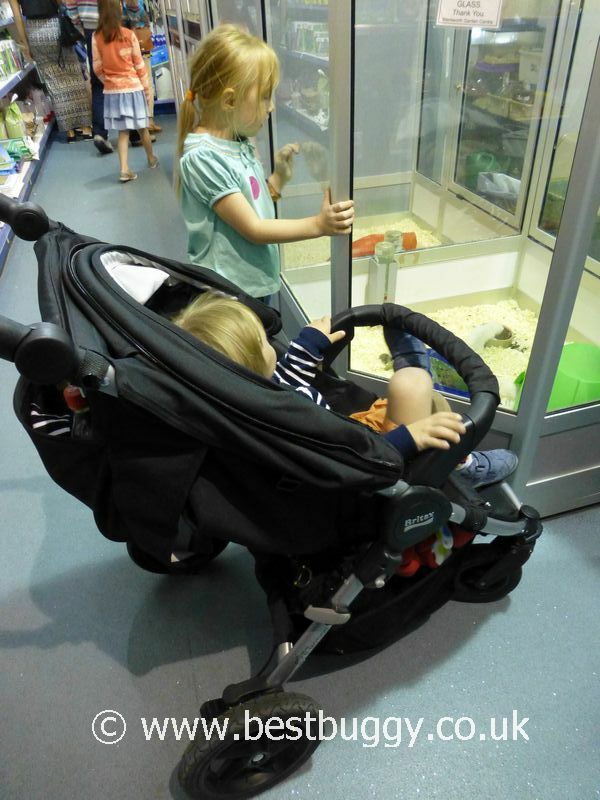 An excellent pushchair, especially for older children. 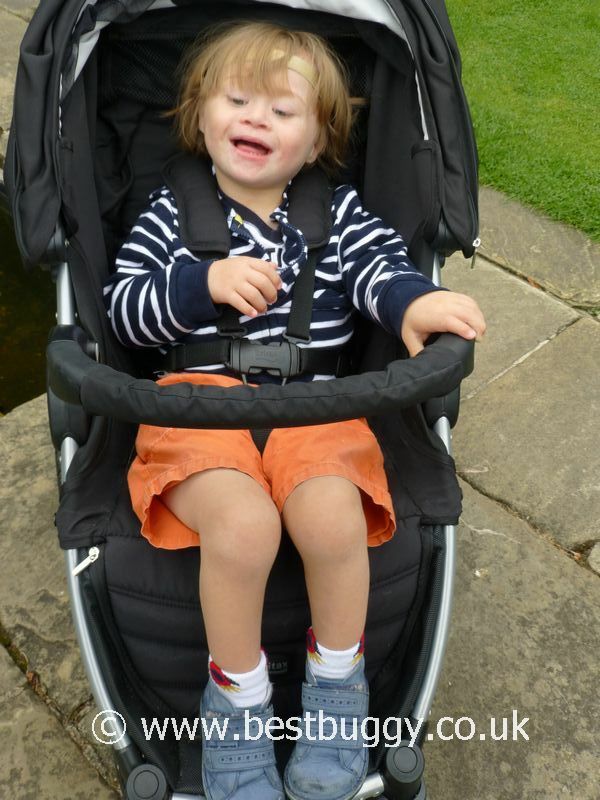 With many thanks to Britax, and also to Kiddicare who are exclusively stocking the Britax B-Motion.